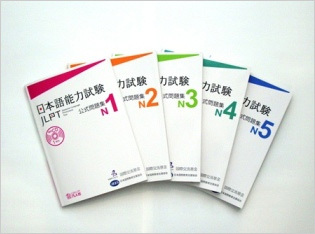 "Japanese-Language Proficiency Test Official Practice Workbook"
For all levels, the workbook contains almost the same number of questions as an actual test, with questions selected from among those used in 2010 and 2011 tests. This is the first official practice workbook for the JLPT since the 2010 revision. ※The workbook is sold by Bonjinsha. See here for more details. ※N1 and N2 have two test sections: Language Knowledge (Vocabulary/Grammar)・Reading; and Listening. The Vocabulary and Listening sections begin with a sample cover page of the test booklet. ※Among sample questions under Grammar and Reading for N1 and N2, please note that reprint of questions from specified sources (following questions) is prohibited without permission. ※N3, N4 and N5 have three test sections: Language Knowledge (Vocabulary); Language Knowledge (Grammar)・Reading; and Listening. Each of these three sections begins with a sample cover page of the test booklet. ※Test item types marked with "－" are not included in the level.